Over the weekend, the world welcomed a new heir to the throne; The Duke and Duchess of Cambridge welcomed their second child, a beautiful 8 lbs. 3 oz. 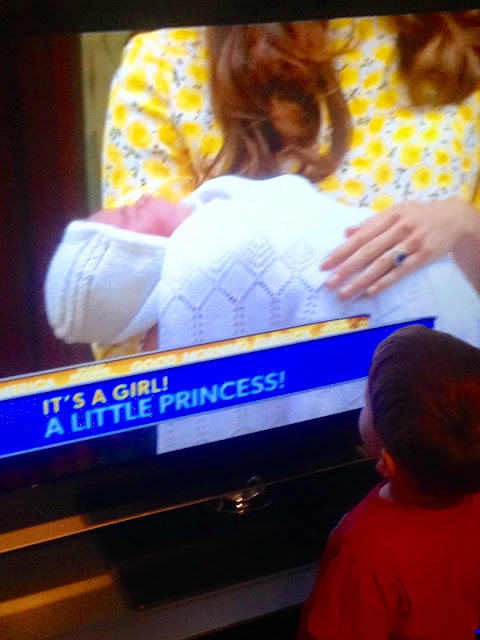 perfect little princess; Charlotte Elizabeth Diana. The little bundle of Princess perfection's official title is, Her Royal Highness Princess Charlotte Of Cambridge. The little Princess, not only brought excitement to the world, she brought on a RAGING case of baby fever. Thanks to the flawless post-delivery beauty and calm of the Duchess of Cambridge, and the super adorable-ness of her precious little newborn, how could the world not catch a case of baby fever? Truth-be-told, raging bouts of baby fever hit me periodically. Between wanting another sweet cuddly baby for myself, and a sibling for Ollie, FTD and I certainly toss around the idea of having baby 'number two'. Then, I start thinking about the fact that I'm 37, with a three-year-old I can barely keep up with, and throw in the towel on number two. After all, my toddler is NUTZO! Keeping up with him and a newborn may send me to a permanently padded room at Shady Pines! Still, with all of this baby talk, I can't help but think back to the moment I found out I was pregnant. Even though, I was fairly certain I was pregnant before taking an at-home pregnancy test, I still freaked out when I saw the '+' come through on my Clearblue test. Sure enough, the test made is very clear, I was pregnant. FYI: I was so knocked up, it took all of four-seconds for the '+' to show up in the test results window. In fact, my Pregnancy Hormone levels were so high, I'm pretty sure I could have breathed on the test and got a positive reading. Overwhelmed by the excitement, and growing fear of having a baby, I screamed and threw my hands up in the air, which sent the Clearblue test flying across the bathroom; eventually landing in the bathtub. FTD, worried that something was wrong with me, came running and said, What's Happened? Are you ok? I just looked at him, then pointed into the bathtub at my positive test, and said, I'm pregnant. He smiled, then lunged for the test. He needed to see the proof with his own eyes. FTD was beside himself. He must have stared at the test for a solid two minutes before saying anything. Once he finally said something, he asked if there was a way to screw up the test, and asked for the directions. I told him you can't really screw up the test, especially a Clearblue easy test. First, it turns pink when you have fully saturated the test strip so you know you've done it right. 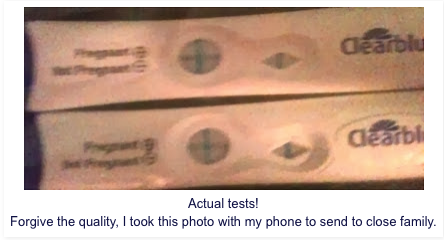 Then, the super easy -/+ to show if you are knocked up or not, rounds out the fool-proof pregnancy test! Still, the box came with two tests, so I told him I would test first thing in the morning, just to double check... not that I needed to. So, here I am, looking at the precious little Princess and thinking, I WANT ONE! I want a snuggly, cuddly, sweet smelling baby! I want a sibling for my toddler. I want a little girl to dress up and have tea-parties with in the garden. Well? Did the royal baby give you a case a baby-fever too?